Want to be notified of new releases in NetSPI/caldera? Pull request Compare This branch is 34 commits behind mitre:master. CALDERA is an automated adversary emulation system that performs post-compromise adversarial behavior within enterprise networks. 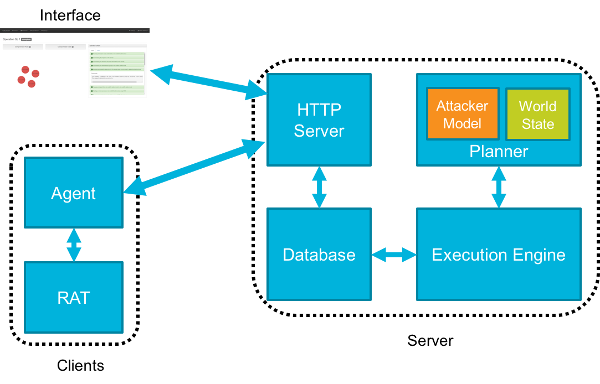 It generates plans during operation using a planning system and a pre-configured adversary model based on the Adversarial Tactics, Techniques & Common Knowledge (ATT&CK™) project. These features allow CALDERA to dynamically operate over a set of systems using variable behavior, which better represents how human adversaries perform operations than systems that follow prescribed sequences of actions. CALDERA is useful for defenders who want to generate real data that represents how an adversary would typically behave within their networks. Since CALDERA's knowledge about a network is gathered during its operation and is used to drive its use of techniques to reach a goal, defenders can get a glimpse into how the intrinsic security dependencies of their network allow an adversary to be successful. CALDERA is useful for identifying new data sources, creating and refining behavioral-based intrusion detection analytics, testing defenses and security configurations, and generating experience for training. 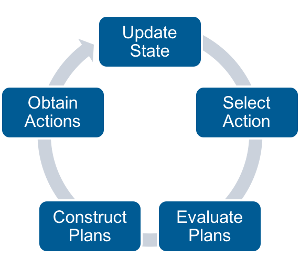 CALDERA's planning system allows it to "decide" the next best action to take based upon its current knowledge of the environment and the actions available at a given point in time. CALDERA's attacker model is represented by pre-configured ATT&CK-based techniques that have been logically encoded with pre and post conditions allowing CALDERA to chain together sequences of actions to reach an objective state. New techniques can be added to CALDERA without having to recompute new decision models because of how techniques are logically defined. It is encouraged to develop new techniques and variations of techniques to better represent the variations in how adversaries can behave and contribute them back to the project. Requirements are detailed in the Requirements documentation. Detailed installation instructions are included in the Installation documentation. The path chaining problems CALDERA's planning system is designed to solve are computationally intensive. While CALDERA's server does not have hardware requirements beyond a typical software developer's system, there are limitations on the number of systems CALDERA can operate over before the planning time between actions will cause significant delays or the system to fail. Thus it is not recommended that CALDERA be used against sets of systems larger than 20. CALDERA performs real actions on systems when operating. If it is being used in a production network, beyond an isolated lab network, then care should be taken to inform any network security staff, administrators, or users who may be impacted prior to using CALDERA to deconflict any issues that may arise. CALDERA uses other open source tools as part of its repository of techniques. Some of these tools are categorized as penetration testing or security auditing tools. See Security for more information. CALDERA does not use or repurpose known adversary malware. It focuses on using adversary behavior documented within ATT&CK, which can be employed in many different ways regardless of specific pieces of malware an adversary may use. CALDERA does not emulate adversary command and control (C2) channels. The variation in adversary C2 protocols and communication methods is vast and is considered out of scope. CALDERA also does not use software exploitation. There are many free and commercial tools that can be used to assess software weakness and exploitability. CALDERA should not be used for this purpose. BRAWL Game - Data set created by the BRAWL project representing one CALDERA operation with data collected by Microsoft Sysmon and other sensors. CASCADE - Prototype blue team analysis tool to automate investigative work.